Magnesium has so many applications in the body and far too many people are incredibly deficient in it. This critical mineral has around 600 applications in the body. In fact, every single metabolic body event, requires magnesium at some stage of the process! This means that if you are deficient, around 600 actions in your body are not functioning at their optimal level. Keep reading for our March special on magnesium products! In our body, energy comes in the form of something called ‘ATP’. ATP is the currency of life – anything that needs energy in order to occur within our body, gets this energy from ATP. You can imagine how necessary it is to life. Take away magnesium, and ATP cannot be utilised. Simple. Magnesium works very closely with calcium. Where calcium ‘contracts’, magnesium ‘releases’ or relaxes. Symptoms including cramps, such as restless legs, aching calves, headaches, PMS, migraines, and other aches or pains, are your body’s way of telling you that you do not have enough magnesium. Alcoholics also tend to have low or deficient magnesium levels. Magnesium levels can be boosted by eating magnesium rich foods in the diet, through supplementation or with magnesium rich body creams / baths. Foods high in magnesium include green leafy veggies, most seafood (ensure its sustainably caught), nuts such as almonds and cashews, sesame seeds, sea vegetables, and even raw cacao powder (hello chocaholics!). Many women get a ‘hormonal craving’ for chocolate. Magnesium rich cacao is used to make ‘pure’ chocolate – see if you can guess which mineral your body may actually be asking you for with your ‘hormonal cravings’! Clever marketing has led us off track to sugary, dairy milk chocolates, but make no mistake, the body absolutely prefers the pure stuff thats rich in magnesium and other beneficial minerals to help with cramping, cravings, moods etc..
Catecholamines include adrenalin and dopamine, meaning magnesium deficiency promotes adrenalin release. Adrenalin is produced in high amounts during stress. Inflammation is as bad as long term stress when it’s chronic. It’s akin to the body being on fire all the time. Soft drinks are no good for minerals like magnesium. The phosphoric acid contained in them messes around with the uptake of magnesium, promoting a deficiency. Here and there your body will deal with a soft drink, drinking them daily though will lead to more than just obesity and its associated problems. Lastly, a word on the many types of supplemental magnesium available these days. Some are wonderful, some are not. 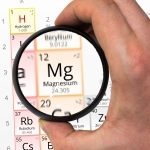 Different types of magnesium, behave differently in our bodies. Their absorption rates can differ widely also. Magnesium oxalate / sulphate are commonly used as laxatives, so if using these to restore your levels, consider switching to a different type. Also, if you find that you need higher and higher levels for a supplement to have an effect, it may be an issue with your absorption of it, or perhaps a problem with your acid / alkaline balance – something our Naturopath can help with correcting. For anyone with digestive concerns, magnesium rich skin creams are a wonderful idea. We stock a variety of different types of magnesium, including creams. Our floatation rooms are rich in magnesium too. Whilst floating, you increase your levels, promote relaxation, get faster recovery of sore muscles and decrease stress and anxiety. ← Why Do Chiropractors Focus On The Back?